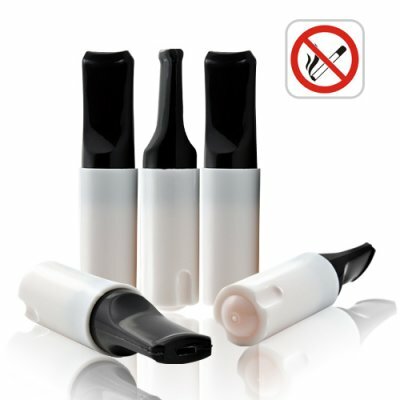 Successfully Added E-Cigarette Refill Pack w/5 Cartridges - Mint (For CVPD-J34) to your Shopping Cart. Refill pack for model CVPD-J34, Electronic Cigarette (Aristocrat Edition). If you are finding it difficult to stop smoking, then you can try the safe and easy to use CVPD-J34 E-Cigarette and these extra nicotine cartridges to give your body the slow adjustment it needs to successfully quit the habit for good. Each refill box contains 5 cartridges of varying nicotine strengths (from high to pure flavor). A perfect product for our partners who are ready to offer their customers a healthy high-tech smoking alternative, or anyone who needs to source additional cartridges for their existing E-Cigarette. Order now at our factory direct price and we will ship your order out within 24 hours. E-Cigarette refill pack with 5 mint flavored cartridges for the CVPD-J34. Important Note: In certain countries this may be considered a medical product by Customs. You are solely responsible for finding out whether this product is legal to import and/or use in your country. We will send you the products you order and cannot accept any liability for customs issues or any implications of your ownership or usage of this device. Before purchasing this item, please check your local laws and import restrictions for this type of device. Check all your favorite sites on the internet - our price is the lowest you can find anywhere for name brand e-cigarettes!